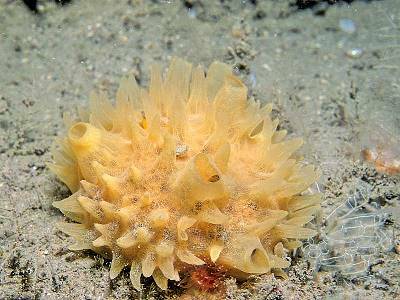 Description: A thick bulbous sponge, with the upper surface covered by vertical, tapering papillae. The surface is clean and smooth and varies in colour from orange to yellow. 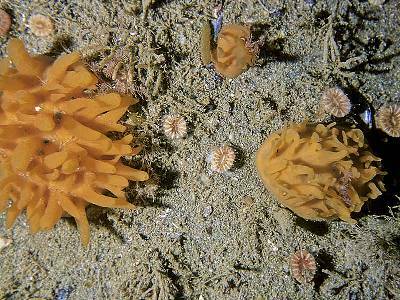 Habitat: Most commonly found on sediment covered, upward facing rock or boulders in the lower infralittoral and circalittoral zones, associated with bryozoans and hydroids. It occurs in a wide variety of physical conditions from areas with strong tidal streams to very sheltered, silty ones. 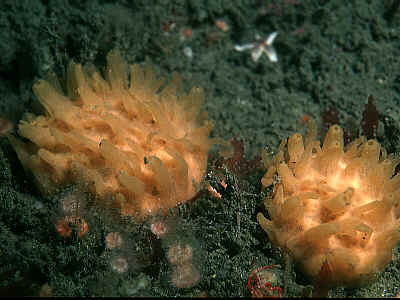 Similar Species: May be confused with Ciocalypta penicillus and other Polymastia species, however P. boletiformis is a much thicker cushion that stands proud on the rock surface whilst other species are low-lying encrustations. Picton, B.E. & Morrow, C.C. (2016). Polymastia boletiformis (Lamarck, 1815). [In] Encyclopedia of Marine Life of Britain and Ireland.